PACIFIC OCEAN - Sailors from Essex Amphibious Ready Group (ARG) and Marines assigned to 13th Marine Expeditionary Unit (MEU) commenced the composite training unit exercise (COMPTUEX) off the coast of California, May 30. COMPTUEX is a Carrier Strike Group (CSG) 15 and 1st Marine Expeditionary Force, Expeditionary Operations Training Group (EOTG) led exercise to certify the ARG/MEU team for their deployment in summer of 2018. Essex ARG is commanded by Capt. 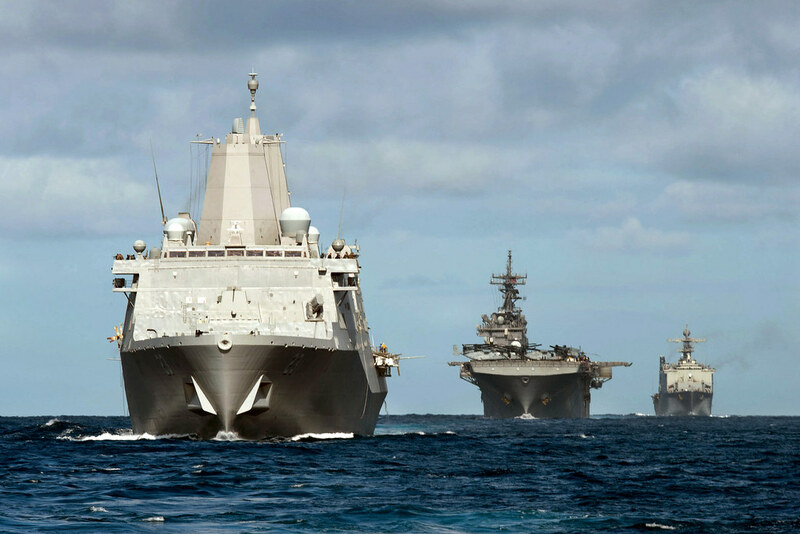 Gerald Olin of Amphibious Squadron (PHIBRON) 1, and comprises amphibious assault ship USS Essex (LHD 2), amphibious transport dock USS Anchorage (LPD 23) and amphibious dock landing ship USS Rushmore (LSD 47). Embarked commands include "Blackjacks" of Helicopter Sea Combat Squadron (HSC) 21, Assault Craft Unit 5, Naval Beach Group 1, Beachmaster Unit 1, Fleet Surgical Team 3 and Tactical Air Control Squadron 11. 13th MEU is commanded by Col. Chandler Nelms and consists of the Command Element; the Aviation Combat Element, Marine Medium Tiltrotor Squadron 166 (Reinforced) and Marine Fighter Attack Squadron (VMFA) 211; the Ground Combat Element, Battalion Landing Team 3/1 (Reinforced); and the Logistics Combat Element, Combat Logistics Battalion 13. "COMPTUEX is designed to make the Essex ARG and 13th MEU Navy-Marine Corps team think, plan and conduct tactical operations for their upcoming deployment," said Rear Adm. Bill Byrne, commander of CSG 15. "Upon successful completion of this rigorous exercise, Essex ARG and 13th MEU will have proven their readiness to deploy." COMPTUEX provides fully integrated Navy-Marine Corps training across the Essex ARG/13th MEU by using training scenarios based on real-world operating events that span joint mission sets. The Essex ARG and 13th MEU performance will be evaluated by CSG-15 and EOTG to certify full readiness to deploy. COMPTUEX follows the ARG/MEU exercise (ARGMEUEX), which concluded earlier this month. "At this phase in our pre-deployment training, our team has demonstrated its ability to operate in complex, uncertain environments and integrate seamlessly with our Navy counterparts," said Nelms. "I look forward to showcasing our Marines and Sailors abilities and validating our capabilities during this certification exercise." Training evolutions include exercises in maritime interdiction operations, anti-piracy operations, close-air support, air assaults, reconnaissance and amphibious operations. "COMPTUEX is our certification for deployment," said Olin. "Once we have demonstrated our abilities as a combined Navy and Marine Corps team, our Sailors and Marines will have proven our abilities to operate across the entire range of ARG capabilities and their readiness to deploy." The Essex ARG and 13th MEU team is conducting its final pre-deployment evaluation to ensure safe and effective coordination across the ARG to achieve mission readiness and the ability to work alongside international allies in the execution of the Navy and Marine Corp's maritime strategy.